I’ll start with what I believe to be the most powerful strategy. A routine works because we are creatures of habit. 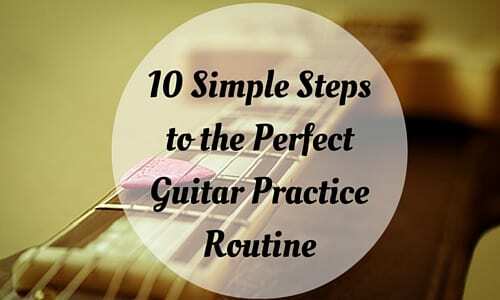 Establishing a guitar practice routine is hard, but once established, it’s generally easy to maintain. Schedule a time you will begin practice each day and absolutely stick to it. Don’t worry about the duration at first. Just start and see where it goes. A common mistake is to decide you are going to be the next Hendrix and practice 8 hours a day. The main problem with starting big is it’s much easier to put it off. 10 mins a day is much easier to commit to than even an hour a day. Very few people I know have empty schedules. The idea is to slowly squeeze out the other less important items on your busy schedule. The hardest part is often starting, and what you’ll generally find is the 10-minute sessions will soon morph into 20-minute, 30-minute, or even 2-hour sessions. Attaching a reward to practice conditions your brain. Our brains are hardwired to seek out rewards. We see ourselves as sophisticated, rational beings, but the truth is, we are no different than any other animal. We have instincts and responses that are mostly the result of evolution. Think of sugar for instance. Most people love sugar despite the fact that we all consume too much. This is because sugar is a source of energy in short supply through most of our evolution. Our brains get a boost after a sugar hit and this is why we seek it out. I am not suggesting using sugar as a reward here, but if you reward yourself whenever you practice, your brain will become wired to want to practice. Planning your practice makes it more likely to happen. This has been shown in several studies. As a guitar teacher, I know that when I ask a student to practice something in a general way, it’s far less likely to be done compared to being specific. For example, I might say “I want you to practice your scales this week”. If I were to say “I want you to practice the C scale in the first position at 70 beats per minute,” the odds of practice go up. Apply this same idea to yourself by deciding ahead of time exactly what you are going to work on. Tracking practice minutes will often ignite your natural desire to improve your score. When I was a teen, video games like Space Invaders were all the rage. Kids would spend hours, and all of their pocket money, trying to beat their high score. There is just something about trying to out do ourselves that pushes us to practice more when we track our practice minutes. When I made practice logs compulsory for all my students, the amount of practice and progress tripled. I was actually blown away by the results. Many of the students resisted at first, but after the first month or two, they were in the game and hooked. Close your eyes and think about where you’ll be in 5 or 10 years. Imagine your guitar playing being awesomely amazing. Feel how it feels to have fingers that just fly all over the fretboard with ease. Imagine people watching you in disbelief. Paint whatever picture works for you. Now, reverse engineer that picture; see yourself practicing for hours every day. When we see our future selves in this way, it motivates us in the present. Seeing a bright, optimistic future pushes us to work harder in the now. If we don’t have that positive imagine in our minds we are far more likely to quit or not even try. When Jimi Hendrix was a kid before ever picking up a guitar he would pretend with a broom. He already saw his future. Imagining our future becomes easier when we read about our heroes. When you read their biographies, you get a sense of where they came from. Even after 35 years of guitar playing, I was still motivated by Steve’s comments. I will also say it’s not just guitar players. It can be anyone who you regard as successful. The road to success at almost anything is the same. There is a lot of work and commitment, and knowing the great achievers just worked harder for longer is motivational. Learning with a friend increases the chances you will practice more often. Surrounding ourselves with like-minded people naturally motivates us. This is because we are inherently social. The people you surround yourself with will influence you sometimes without you even realizing. One study showed that if your closest friends are obese, your chances of being obese are much higher than average. Having friends who play guitar inspires you to keep up. You can even practice together. Set a time each week where you come together and practice. Again, be specific. Perhaps work on a song together. There’s nothing like a good concert to charge your practice batteries. It doesn’t have to be some big star where you pay $100 or more for a ticket. Seek out some talented, local guitar players and bands who motivate you and try and see one of them at least once a month. When a big name act comes to town you can splurge, but work within your budget. In between that, watch some YouTube concerts. There are so many great videos today, that there is simply no excuse. Concerts are highly motivating so build it into your guitar practice routine to go to a concert or local performance or watch a video every week, and watch your motivation to practice go way up. In my mind, a performance is game day. If there is no game day, what’s the point in all the practice? Performance makes practice meaningful. When you know you have a performance coming up, the pressure to practice goes up. This is a good thing and is one of the reasons I always encourage students to aim to perform once a month. I would say the motivation to practice is in direct proportion to the number of people who will see you perform. When we look at the biggest acts today, their motivation is huge. They can have millions of people watching them so their practice schedules are intense, especially leading up to a big performance. In your case, start small: perform for family and friends, and then progress to an open mic venue. As you improve, you can hit larger audiences. David Hart began learning guitar in the early 1980s studying under various teachers, most notably Mark Bergman as well as studying jazz fundamentals at the Sydney Conservatorium of Music. Learn more about David and the G4 Guitar Method here!